Scholars sometimes consider Climacus as the end of a trajectory of thought that may be visualized roughly as a sunwise pilgrim trail blazed from Scetis and Nitria up to Alexandria, over to Gaza and Palestine, and back down to Sinai. Climacus is strikingly fond of the Apophthegmata Patrum and related literature from (or at least purporting to come from) Egypt, using and mimicking tales and sayings liberally throughout the Ladder. He read this literature, though, very often in the light of its interpretation and utilization by the Gaza Fathers, Abba Isaiah (d. 491), Barsanuphius (d. c. 540), John (d. 542), and Dorotheus (d. c. 578). Chryssavgis would go so far as to say that “John could be seen as a deliberate continuator or a direct successor of this school of spirituality.” The reasons for this are easily discernible. Not only were the Apophthegmata Patrum first written down and collected in Palestine, but one of the earliest collections of apophthegmata comes from the Asceticon of Abba Isaiah (Logos 8). Numerous sayings, with and without names, but substantially belonging to the Apophthegmata Patrum as we now know it, are to be found in the Gazan Quaestiones et Responsiones. The Gaza School was inspired by the variety of sayings and stories associated with the Egyptian desert and, most likely for that reason, helped collect and edit them. Under this model, the best way of understanding Climacus is to first read the Desert and Gazan literature, see the themes and ideas developed there, and examine how Climacus handles them. Of course, the “Desert–Gazan” model is hopelessly vague with regard to the Ladder's specific subject matter, apart from helping to explain Climacus' own emphasis on “spiritual fatherhood.” But it does alert us to the kind of mindset, the preferences and animadversions that Climacus might have encountered. It can also expose the tensions and ambiguities of the literary tradition within which Climacus worked. This model certainly proposes a more useful genealogy of literature and ideas rather than the static categories of the "Evagrian-Macarian" model, it reveals the kind of literature to examine in order to better understand Climacus' work. 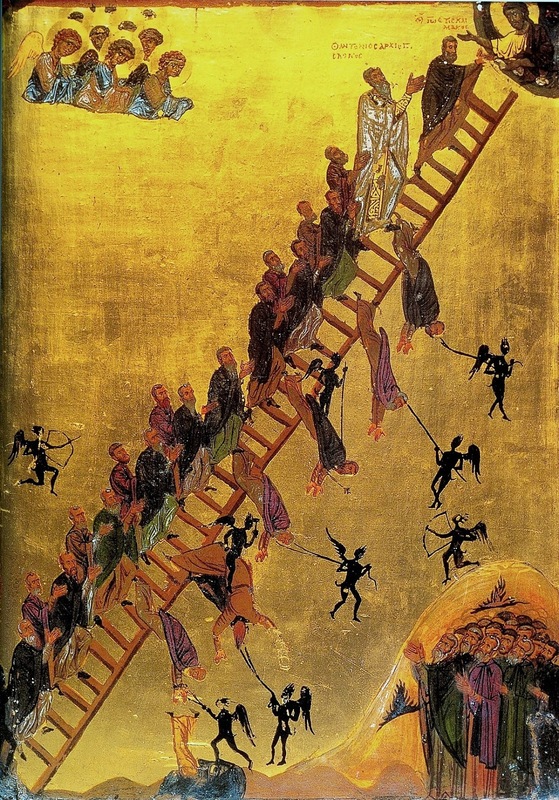 From The Role of Death in the Ladder of Divine Ascent and the Greek Ascetic Tradition, p. 16.